Rumors of an Apple television set have been circulating for years, but the company has repeatedly expressed doubts about the feasibility of entering the market. Steve Jobs himself noted that the current environment of "balkanized" cable operators controlling everything through their own set-top boxes makes it difficult to envision a go-to-market strategy for Apple. But Walter Isaacson's forthcoming biography of Jobs suggests that Apple may have developed a solution to those ideas, stoking optimism for an Apple-branded television set. Jobs' comments were revealed in an excerpt published by The Washington Post. The report notes that it is not clear what Jobs meant by having "cracked" the television problem, but it seems to focus on leveraging Apple's new iCloud service and potentially existing iTunes Store content, all within an easy-to-use television set. Why don't you post the whole book already? By the time the book comes out, I can just piece all these excerpts together and not have to buy a copy! soo....he wanted to make the tv cost about 4 times more than they do now? kinda hard to imagine people would fork over 4-6k for a tv....then again this is apple, people will give their left nut for it. Give it a rest. 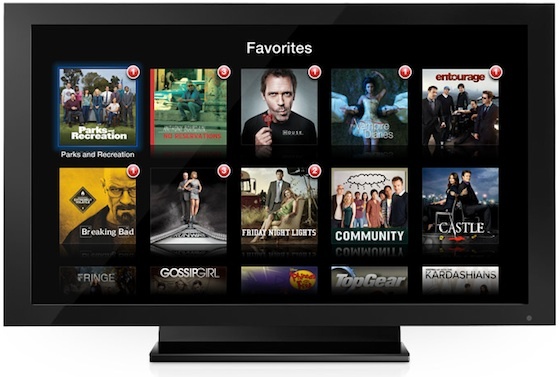 How's that sub-$500 Android tablet and sub-$100 GoogleTV working out for you? Why is Fermat's Last Theorem running through my head? Damnit...anyone want a brand new Samsung 55" 8000 series 3DTV??? Only a month old!!!! Na. I think the book is like 500 pages. That's going to be a big box to carry home from the Apple store. Surprised how open he was about unannounced products and strategies.